Black-Letterhead 1.6.1 fixes the footer bug found in Internet Explorer as well as the diminishing fine print within threaded comments. Please update your themes. Here’s a list of the Top 15 WordPress Plugins I use on this site. 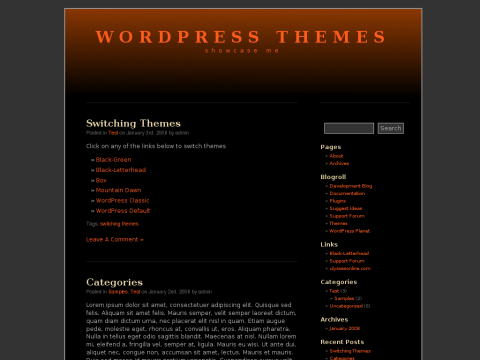 Plugins gives WordPress added functionality. WordPress was designed to be lean keeping the engine fast and flexible while minimizing code bloat. WordPress plugins vary in function from catching spams, providing stats, doing backups, download counters, comment functions, executing PHP, page navigation, creating sitemaps, adding meta tags, displaying videos, etc. Akismet – Akismet checks your comments against the Akismet web service to see if they look like spam or not and lets you review the spam it catches under your blog’s “Comments” admin screen. All in One SEO Pack – Optimizes your WordPress blog for Search Engines (Search Engine Optimization). WordPress Database Pickup – WP-DB-Backup allows you easily to backup your core WordPress database tables. You may also backup other tables in the same database. WordPress Stats – focuses on just the most popular metrics a blogger wants to track and provide them in a clear and concise interface. Google XML Sitemaps – creates a Google sitemaps compliant XML-Sitemap of your WordPress blog. It supports all of the WordPress generated pages as well as custom ones. Subscribe to Comments – enables commenters to sign up for e-mail notification of subsequent entries. The plugin includes a full-featured subscription manager that your commenters can use. EXEC-PHP – The Exec-PHP plugin executes PHP code in posts, pages and text widgets. WP-Download Monitor – Download Monitor is a plugin for uploading and managing downloads, tracking download hits, and displaying links. Author Highlight – Author Highlight is a plugin that prints out a user-specified class attribute if the comment is made by the specified author. It is useful if you would like to apply a different style to comments made by yourself. Audio Player – Audio Player provides you with a simple way of inserting a stylish Flash mp3 player on your WordPress posts and pages. Features include configurable colour scheme, enclosure integration, runtime options such as autostart and loop and ID3 tag integration. WP-Syntax – WP-Syntax provides clean syntax highlighting using GeSHi — supporting a wide range of popular languages. It supports highlighting with or without line numbers and maintains formatting while copying snippets of code from the browser. Sociable – Automatically add links to your favorite social bookmarking sites on your posts, pages and in your RSS feed. You can choose from 99 different social bookmarking sites! Related Posts – WordPress Related Posts Plugin will generate a related posts via WordPress tags, and add the related posts to feed. WP-Page Navi – Adds a more advanced paging navigation your WordPress blog. Do you any suggestions, recommendations, substitute? Please let me know. Black-Letterhead 1.6 featured with a sample header image. Black-Letterhead 1.6 is now available. The latest version now supports WordPress 2.7 which comes with several enhancements. The bulk of the WordPress 2.7 enhancements is in the redesign of the administration page – the Dashboard. It sports a new vertical menu bar on the left side with lots of new features too numerous to mention here. Black-Letterhead 1.6 takes advantage of one of the latest enhancements of WordPress 2.7, particularly in the area of threaded comments. Threaded comments are replies within a reply. Replies are placed directly underneath a reply instead of at the end of the list. Threaded replies are also indented to display a thread discussion. Threaded comments will need to be enabled in the `Settings – Discussion` for the threaded comments to show up on the screen. Once enabled, you will see `Reply` links on every comment. Clicking on the `Reply` makes the comment form jump to that particular comment. `Click here to cancel Reply` will restore the comments form to the bottom. If your blog is running an older version of WordPress, then the theme will run the `legacy.comments.php` file. This is where the old comments.php code is stored. The code here is essential to keeping the Black-Letterhead downward compatible to older versions of WordPress. To change colors or page widths, just click on `Preferences` located at the bottom of the Sidebar. The script sets a cookie in the user’s browser for a period of 365 days. If the cookie gets deleted, it will revert back to theme’s default setting. Cookies allow for browsers to remember the user’s preference for a period of 365 days. Another feature in 1.6 is the support of multiple and rotating header images. To add a header image(s), just place a 960x200px header image or images in the `images` folder. The script automatically detects an image and will display it. If more than one image is present, the script will randomly display the headers. If there are no images, the theme displays in normal mode. Black-Letterhead 1.6 comes with a sample header image in the `images` folder. Just delete the image if you don’t want it. If you want rotating headers, just place 2 or more images in the same folder. The rotating script will randomly display the header images. If you use the Firefox browser, you may have to press Ctrl-F5 to refresh the screen. As always, for support questions, please visit the Support Forum.